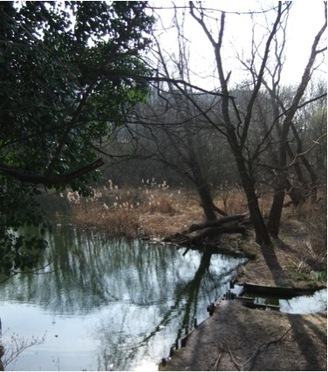 In my previous blogs, I made brief mention of greenery and biodiversity. The latter is under increasing threat in our cities. Especially in colder climates, our endless quest to increase building airtightness results in reduced nesting and roosting opportunities for birds and bats. 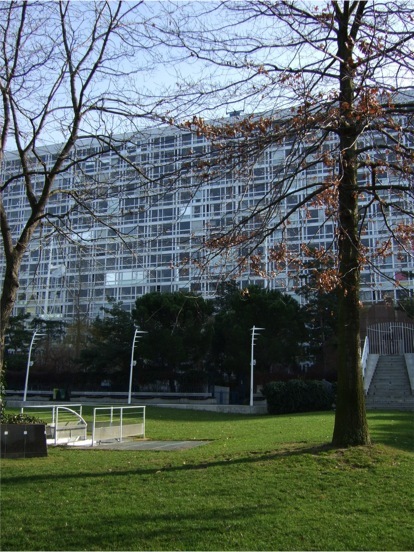 Aside from incorporating wildlife habitat spaces in our buildings, the careful integration of greenery would not only support biodiversity habitats, but could lead to various positive outcomes including: the absorption of CO2 and pollution from car exhausts; reduced energy consumption in buildings; the minimisation of the effects of warm summers and urban heat islands, and increased water absorption through green and permeable surfaces. As long as native plant species are used, greenery in cities is of benefit to humans and to native wildlife. 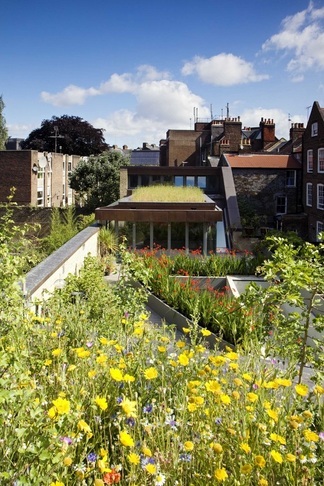 In dense urban areas, green space is particularly important to alleviate urban density pressures, providing human scale and a more attractive environment, as well as marking changing seasons with leaf changes and floral displays. Additionally, green spaces are also known to improve city-dwellers’ wellbeing, leading to decreased mortality. This is why it is crucial to ensure that the average global city-dweller lives within a 5-6 minute walk (or 300-400 meter radius) of a green open space. This can consist of a park, an outdoor sports area or playing field, but also squares, allotments, rivers, waterways, ponds, wildlife areas and reservoirs. 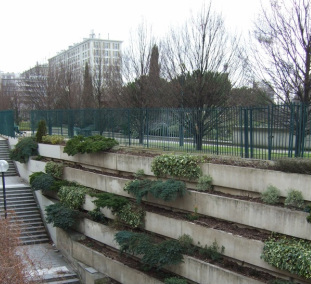 An alternative open space could also include the delightful planted rooftop of a building, which provides a visual amenity and relief for surrounding buildings, as well as giving direct access to city-dwellers, such as the Jardin Atlantique on top of the Montparnasse station in Paris (see below). To truly support native wildlife, continuous green habitat corridors need to be created, which connect smaller green areas with larger, more undisturbed city-edge habitat areas. This also maximises urban residents’ access to large and varied open spaces with interesting cycle and walking routes. Fragmentation of open spaces is problematic and occurs when patches of green are interrupted by roads and traffic. This isolates species from their habitat and other food or nesting sources, which affects their breeding gene pool and survival rate. 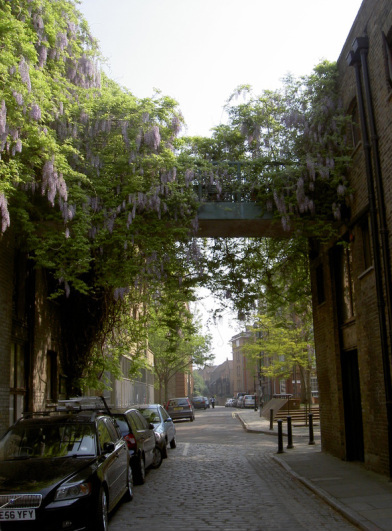 So where disruptive new roads and passageways occur, undercrofts or green bridges can be introduced to interconnect the spaces. In addition to ensuring the safe movement of small mammals between open spaces, these measures also provide safe crossing conditions and uninterrupted enjoyment for visitors. 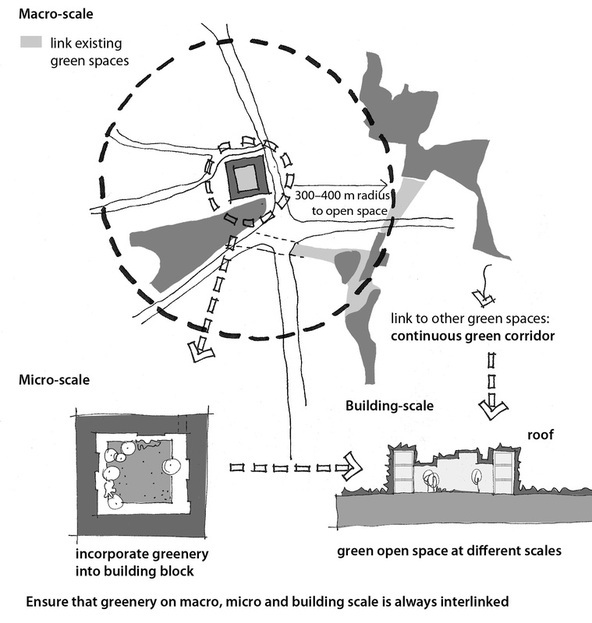 It is for the same reason that greenery should be interlinked at macro, micro and building scale, as illustrated by the diagram below. In several cities, the integration of greenery to the benefit of local city-dwellers and native wildlife has been extremely successful. For instance, this has been the case in London, Paris, Brussels and New York, where disused railway lines have been turned into pedestrianised ‘high walks’. After years of neglect, open spaces such as these were often earmarked for development, and it fell on local residents to win the battle to retain these special areas, and in some cases improve them. 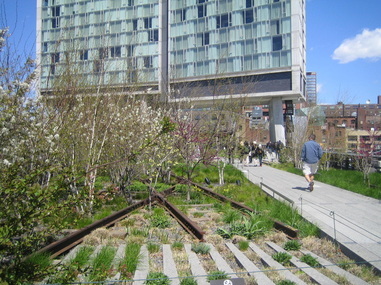 I have not visited New York’s central ‘High Line’, but if my experience from regular visits to Paris’ central ‘Promenade Plantée’, North London’s ‘Parkland Way’ and Brussels’ ‘Le Moeraske’ * is anything to go by, they are wonderful opportunities for city-dwellers to escape the hustle and bustle of the city and reconnect with nature. They are all of a very different nature and not necessarily based in central city-areas, but this diversity proves that there is not any single way to create a successful urban open space for city-dwellers and its native wildlife. London’s Parkland Way is wildlife-rich due to the fact that it links two larger open spaces at either end and has also been sparsely designed or maintained, allowing it to grow ‘wild’ for longer than the Paris and New York links. 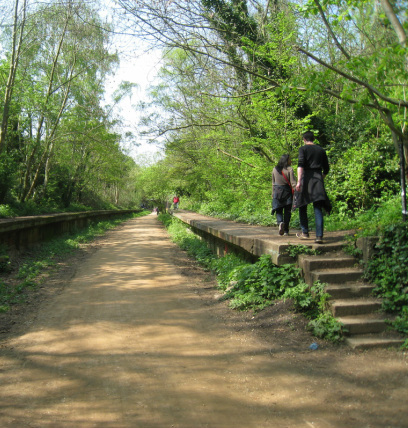 In the summer, you can go and pick wild blackberries without realising you are on a disused railway track, were it not for the occasional passing of what were once railway platforms. In Brussels, ‘Le Moeraske’, meaning ‘the little marsh’, is probably the most wild-life rich due to its swamps, which are inaccessible to visitors, but much loved by wildlife such as ducks, frogs, toads, bats, weasels, the red fox, and many more bird species and native flora. 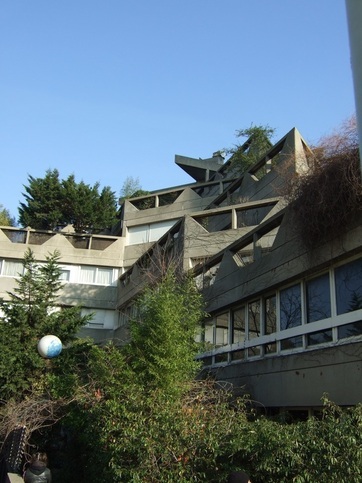 It is a truly amazing space, which is so easily accessible and makes up for a city-dweller’s ‘concrete’ living. The Paris link is rather incredible in different ways, as it departs from a central point off the Opera Bastille and opens up into larger urban open spaces (and urban woods on the outer edge). The passage also contracts into narrower green bridges between buildings – which I gather is much like Manhattans’ High Line according to Kayla Friedman’s beautifully described experience. Both the Manhattan and Paris railways are well-designed and maintained, providing a visual amenity for surrounding city-dwellers overlooking the spaces and access to richly inhabited bird and insect ecosystems. Most city-dwellers would argue that these spaces are invaluable and should be treated as such. Indeed, to experience birds and other wildlife from within the hustle and bustle of city life, is not only good for wildlife, but for us city-dwellers too. * Unlike the other examples, Le Moeraske is actually not along a disused railway line, but along a used railway line and on the site of an abandoned motorway leading into Brussels.